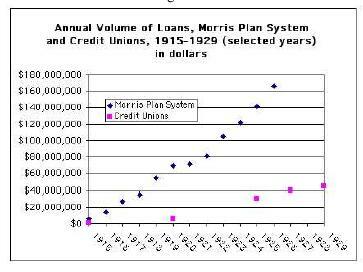 Morris Plan banks were at the forefront of an explosion of consumer credit that started at the beginning of the second decade of the twentieth century and they became the prominent institution for providing consumer credit to the poor through the 1920s. At the time Morris Plan banks first appeared in 1910, few institutions existed for provision of consumer credit to low- and middle-income individuals. Aside from retailers, the primary provider of consumer credit to the poor was the loan shark. Other institutions designed to provide consumer credit were also being introduced at that time. 1. Character, plus earning power, is a proper basis of credit. 2. Loans made on this basis of credit must carry the privilege of repayment over a period long enough to match the earning power of the borrower. 3.Money so borrowed should always be for some constructive and useful purpose. The formal lending process may be presented with an example. Consider a borrower who sought a $100 loan. An interest rate would be set and a fee deducted from this face value amount, perhaps $8 total ($6 interest, $2 fee). The borrower would then subscribe to $92 worth of what were called Class C installment certificates. The borrower did not directly pay back the loan, but rather over the course of the year purchased the Class C certificates. At the end of the loan period, the borrower exchanged the Class C certificates for cash to pay back the original loan. It is important to note that the loans were not secured with collateral. Instead, borrowers had to find two cosigners who were well acquainted with the borrower and who were of similar economic standing (i.e., they had similar and steady earning power). The emergence of Morris Plan banks in the early twentieth century is an example of an institutional structure appearing organically in response to a perceived need and through the private sector to satisfy a consumer need. Unlike many modern institutions that provide micro-credit, Morris Plan banks developed as a profit-making institution within the private sector. They came into existence at a time when there were not adequate institutions to supply consumer credit to the poor and, within a matter of years, commercial banks had adopted their basic lending principles. The Morris Plan lending structure would appear to have been devised by someone informed by recent studies of micro-credit institutions. The cosigner requirement of the lending structure imposed a type of joint liability which would induce responses that reduced the transaction costs associated with the lending process and alleviated adverse selection and enforcement problems which have been identified in the micro-credit literature as sources of credit market failures. Evidence supports the presence of these incentives in the Morris Plan lending structure. The lending structure also appears to have been attuned to the unique nature of Americans generally. Indeed, the contrasting experiences of credit unions and Morris Plan banks during this period has lessons for the creation of financial institutions which supply micro-credit. In designing micro-credit institutions, lenders should consider the social and cultural context into which the institution is to be introduced. In the present context, the Morris Plan structure was more attuned to the individuality of typical Americans than were credit unions. Of course, this is a point that has not been lost on researchers in this area (e.g., Ghatak and Guinnane (1999), and Pickering and Mushinski (2001)). It should also be noted that the Morris Plan was not without critics, especially from the Russell Sage Foundation which viewed the lending procedure to be misleading at best, and at worst, an attempt to defraud the borrowers. Hence, many viewed the profit-seeking Morris Plan institutions as little better, and in some respects worse, than loan-sharks. The demise of the Morris Plan institutions begins with the full recovery of banking after the Great Depression. By that time, however, the basic Morris Plan idea of providing small consumer loans to individuals had been fully incorporated into commercial bank lending practices. By 1924, commercial banks in New York began to offer small consumer loans. As bank charters were altered by states, and eventually by legislation at the Federal level, the size of consumer lending by Morris Plan banks was dwarfed by commercial banks that offered the additional convenience of accepting demand deposits. In addition, credit cards and consumer installment credit decreased the uniqueness and demand for loans from Morris Plan institutions. By the post-war period, the Morris Plan banks, though still active, were only a small segment of consumer lending. Today, there are still two chartered banks in the U.S. with Morris Plan in their name, but they are small community savings banks and no longer operating strictly on the Morris Plan principles. Ghatak, Maitreesh and Timothy W. Guinnane . “The Economics of Lending with Joint Liability: Theory and Practice.” Journal of Development Economics 60 (1999): 195-228. Mushinski, David and Ronnie J. Phillips. “Micro-credit.” In International Encyclopedia of Business and Management, 8 volumes, edited by Malcolm Warner. London: Thomson Learning, 2001. Pickering, Kathleen and David Mushinski. “Cultural Aspects of Credit Institutions: Transplanting the Grameen Bank Credit Group Structure to the Pine Ridge Indian Reservation.” Journal of Economic Issues (2001): 459-467.